With ground transportation in Haiti severely limited following last week's massive earthquake, the U.S. military begun a series of air drops Monday afternoon to deliver aid supplies to the Haitian people. CBS News has learned that the Air Force is flying C-17 transport planes out of Pope Air Force Base in Fayetteville, N.C. Each plane will deliver 40 aid bundles per trip and the military is planning to deliver 600 bundles over three days. 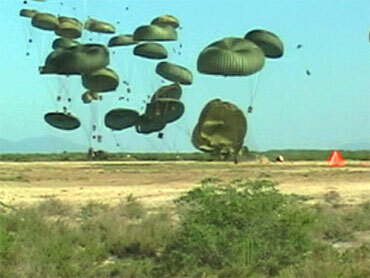 The military has secured three drop zones where the aircraft can unload from an altitude of about 1,000 feet. A plane already in the air is set to deliver 14,000 MREs - the calorie-dense "meals ready to eat" used by the military in combat zones - and 14,000 quarts of water. Secretary of Defense Robert Gates told Reuters Friday that air drops in the immediate aftermath of the quake would have been "a formula for contributing to chaos rather than preventing it." "Without having any structure on the ground, in terms of distribution, that an air drop is simply going to lead to riots as people go after that stuff," he said. Sixteen ships and 48 helicopters are offshore flying in water and taking out the injured, but the help the U.S. promised has not arrived as quickly as planned, reports CBS News correspondent David Marin. The Pentagon said it would have 10,000 men and women either ashore or afloat by Monday. The actual number is less than 7,000. Delays at the airport have put the 82nd Airborne two days behind schedule, and a U.S. officer said Haitian air traffic controllers were simply unable to handle all the incoming flights. Governments and humanitarian groups have struggled to get aid to the neediest Haitians in the week since the earthquake.